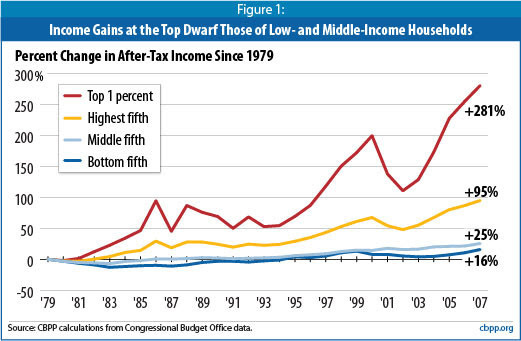 My dear conservative friends will blame the shrinking middle class and more McJobs on Obama, naturally. But to see they're wrong you only have to look at their policy "fixes": no minimum wage; no guaranteed health insurance for workers; no right to unionize; and privatizing Medicare. Oh, and cutting unemployment benefits to motivate more people to compete for low-wage jobs, thereby driving wages down even further. The most radical Tea Partiers even say we should abolish the Department of Education, when U.S. public schools are most people's shot at a better life. None of these ideas makes any economic sense. (It makes a heckuva lot of sense from a class warfare perspective, however.) And in the case of conservatives' debt fetish, they confuse economic cause and effect: debt causes recessions, not the other way around. So they can't diagnose the problem, nor can they prescribe any cures. But wait, they have more great ideas. Cutting "job-killing regulations" and income taxes on the rich should stimulate growth, then all the unemployed could get jobs in the new businesses that Republicans say their hands-off policies would create. Yet we tried that before and saw how it worked out. Conservative talk radio says we can all move to Texas or North Dakota and find high-paying jobs in the shale gas boom, but that's hardly practical. Most people can't just pick up and move their entire lives, like Okies of the Depression era, to where the jobs are. Doesn't matter. Republicans want to open up even more public lands for oil & gas drilling, even though that oil is sold by multinational corporations on the world market; it's not "ours." Or as I like to sum it up, the GOP thinks we can cut and burn our way to a better economic future. It’s the sixth year of Barack Obama’s presidency, the job market is still sluggish, most Americans say they’re unhappy with the economy, and Obama’s approval ratings are down. So what’s the Republican plan to turn it around? The answer is, they don’t all think they need one and those who do can’t agree on a unified view. This is why it's so ominous that Republicans, thanks to gerrymandering and stronger off-election turnout, could take over Congress in November. I'm not saying they're solely responsible for the Great Recession, (although Phil Gramm could certainly make a case), but they certainly haven't learned any economic lessons from it, and that's scary. This is a party that's pissed off yet feels zero responsibility for its policies -- it's a veritable chimpanzee with a hand grenade.... And they have as many good ideas as a chimp how to grow the middle class and get Americans back to work. The US is slowly becoming a McJob nation. 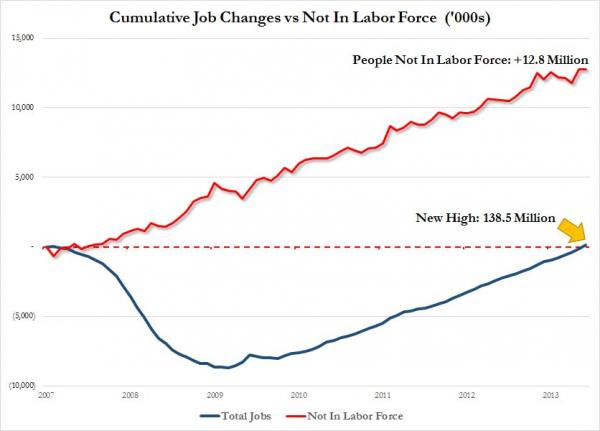 While the press jumps up and down that the US is now finally at a breakeven point from the jobs lost since the recession started in 2007, they fail to mention that those not in the labor force is up by nearly 13 million. Even looking into the recent employment report, we continue to find a heavy trend of hiring in low wage employment sectors. For example, 32,000 jobs were added in “leisure and hospitality” bringing the annual total of jobs added to 311,000. Another 21,000 jobs were added in social assistance which pay very little but will grow as demand for health support grows by an aging population. The system at least in the eyes of Wall Street and the government is working perfectly fine. We have a plentiful supply of low wage labor while laws and bailout mechanisms are in place for the financially and politically connected. The middle class continues to fall off the bandwagon one by one and enters a labor force of permanent low wage labor with very little prospect of a decent retirement. In fact, most will be working until all the wheels come flying off. We also find that 1 out of 4 Americans are working in jobs that pay $10 or less per hour. How about trying to earn the Americans Dream on that McJob salary? It has taken us 7 slow and painful years simply to recover the jobs we had back in 2007. With the latest jobs number, we finally are back to where we were in 2007. Of course, the population has increased and many of these new jobs come with horrible benefits, lower wages, and very little security. Is it any wonder why home buying in the country continues to be so anemic? A part of this growth is an older population but a large part of it isn’t. We have many digging into college degrees with massive debt to avoid the current economic situation. Others have simply given up looking for work. The low wage recovery has been extremely painful for many Americans and wealth growth has not occurred for 90 percent of the country. These are simply the facts. This is what we find in every piece of data we look at. 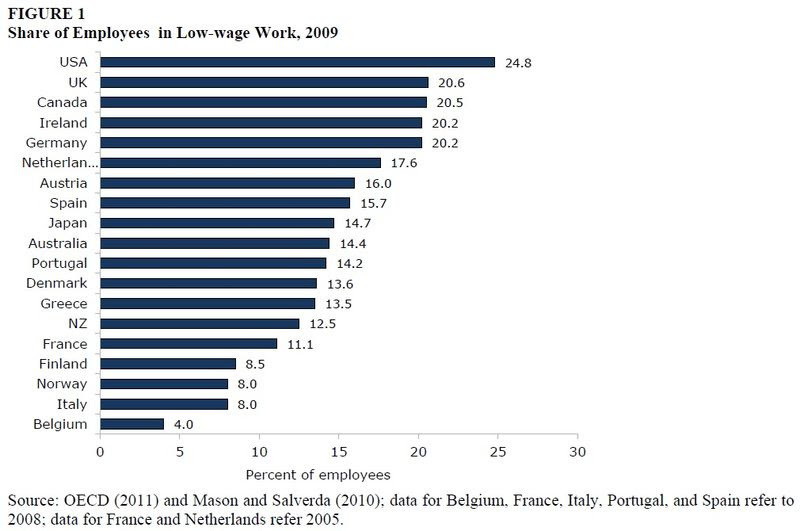 Low wage work as defined in the data set above is employment that pays less than $10 per hour. Imagine trying to support a family on this. 2,000 hours of work would yield $20,000 which is below the poverty line for a family of three. And then we wonder how we have roughly 47 million Americans on food stamps. But for the rest of country people are running the Red Queen’s Race by working harder and harder simply to stay in the same place. A McJob recovery is not something to be proud about especially when the middle class in the US continues to dwindle.